A few months ago, Scott Switzer (formerly of Metro! 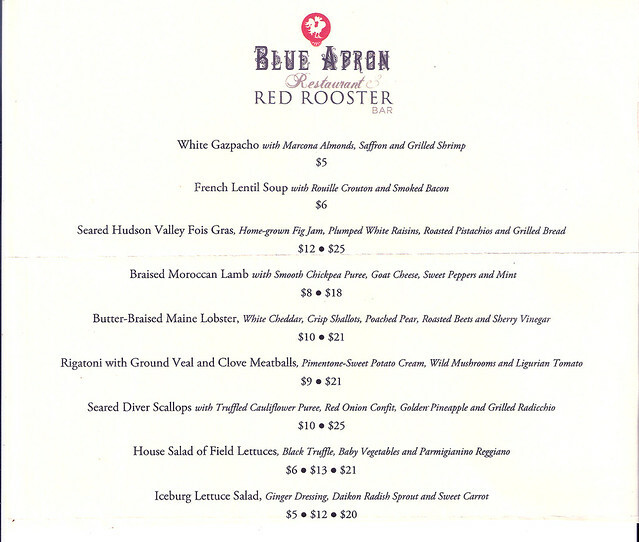 in Roanoke) opened his new restaurant: Blue Apron Restaurant & Red Rooster Bar. I’d been anticipating the opening for months, checking his rather useless blog/website, noting the call for applications for servers, hoping and hoping and hoping that it would actually open. Much like Lucky, it seemed to take forever. Then it actually opened. And then I was sick and G. was sick and we were traveling and I was teaching on top of cheffing almost full time and I never went. Back on February 23 (a month ago already–I have my reasons for not being around, will get to that later), G & I finally decided to check it out. The 23th was a Wednesday night–an easy night to pop in a restaurant in the Roanoke area around 8 pm and be guaranteed a table immediately. Guess what? No table. Blue Apron was packed. The front of house was very apologetic and made out like it would be quite some time before a table opened. But twenty minutes is spare change and a drink in hand is always a good thing. (Note: I forgot to take a picture of the interior, apologies). Shuffled over to the Red Rooster Bar–a tiny bar space adjacent to the restaurant–we placed our drink orders with the very helpful (almost too helpful at times) sommelier/bar tender, and perched on the red, metal stools to wait for our table. Thoughts about the bar: the bar stools are extremely uncomfortable and the along-the-wall shelf for placing drinks is so tiny that I was afraid I’d make a scene by knocking mine off. The bar itself is lovely (old, dark wood, intimate), but the intimacy is somewhat of a drawback: only three people can sit there. I prefer sitting at bars to tables in many restaurants, but I certainly can’t count on it there. A shame. The drinks, however, were good. Not mind-blowing good, but good. 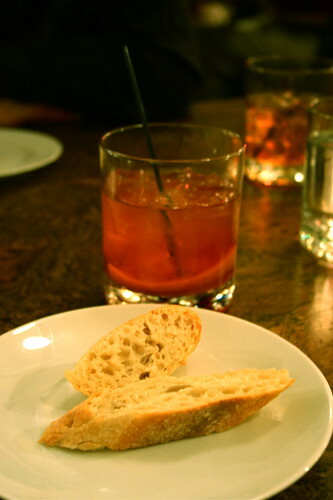 My old fashioned was balanced nicely, and the second one I ordered was even better. I don’t know how many folks are mixing behind the bar, but it could be good to get a little more even with the proportions. Once seated, G & I were finally handed a menu and I finally got to see what the restaurant has to offer. (The website lacks the useful information of a menu, and this had been bugging me for some time, thus, you’ll find the menu posted below. Hopefully it will help some folks out who are wondering about it.) Nothing struck me as “I’ve got to have it” at first, but everything looked wonderful. In that I mean, nothing looked exceptional or out-there or wildly creative, but it looked comfortably American-French with a local twist. One of the great things is that everything is offered in a large or small (sometimes even medium) portion–perfect for sharing and perfect for anyone who wants a taste of several plates. 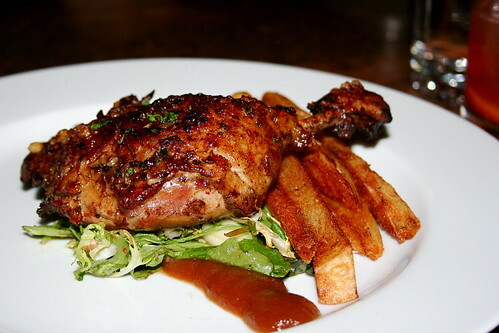 We started off with the “Warm Frisee & Duck Confit Salad w/ Spiced Apple, Roasted Garlic Aioli, Pickled Vegetables, & Handcut Fries.” At $12 for the small portion, it seemed like a steal on the menu. And it was incredible. I’m a sucker for duck, but the portion of confit seemed extraordinarily large for the small plate, the apple and pickled vegetables complimenting the warm and dark meat perfectly. When thinking of cold, wintery evenings and comfort food, this confit is going high on the list. I honestly could have done without the frites, but they didn’t detract from the dish. Just seemed extraneous when compared with the perfectly executed confit and accouterments. Next up was the “Rigatoni w/ Ground Veal and Clove Meatballs w/ Pimentone-Sweet Potato Cream, Wild Mushrooms, and Ligurian Tomato.” Again, we ordered the small portion ($9) to split. And, for some reason, the kitchen decided to split our small order into two plates, thus giving us what I truly think was two small portions for the price of one. I’m not complaining, especially since I’ve been dreaming about this dish for weeks now, dying to have it again (and have it soon), but I do wonder if that’s standard protocol and, if so, how the restaurant makes any money (though I doubt many people split–side note: why on earth don’t couples split everything? Mind boggling). The pasta, the meatballs? To die for. 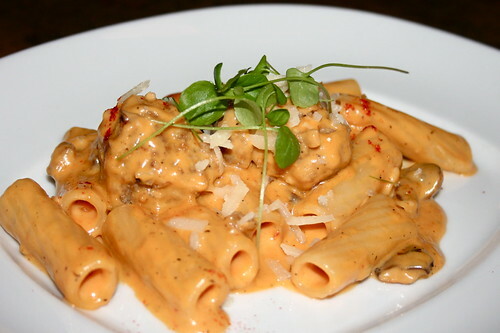 The rigatoni was cooked perfectly al dente, the meatballs rich and dark and down-to-earth, and the sauce–my god, the sauce–was the perfect blend of rich and cream and sweet and sour and acidic. I want to bathe in it. I want to eat it every day. I want this dish served at the wedding I never want to have. If you order anything at Blue Apron, order this. Please. You’ll thank me for it. And last, but not least, we ordered our main: “Curry-Dusted Swordfish w/ Golden Potatoes, Radicchio, Soft-Cooked Egg, Apples, Capers, and Lobster Butter” ($15, small portion). Now, the shame is that post-duck confit and post-rigatoni from heaven, we were stuffed. The reason why we split everything (and small plates) is that we like to sample several courses, but after the first two large portions, we were busting at the seams. So I’m afraid I wasn’t able to enjoy the swordfish as much as I might have otherwise. Again, our portions were split onto two plates, and again, the dish looked amazing and tasted just as good as it looked. 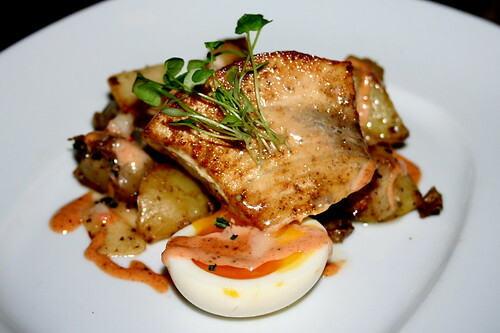 The swordfish was lightly seared and dusted with curry and served with roasted chunked potatoes & radicchio, and a soft-cooked egg. I’m, again, a sucker for soft, runny, yolky eggs, and I think it was a great addition to the dish. Gave a nice earthy element to the fish. The fish was executed well–flaky and cooked evenly throughout and not over-done–but it could have used a little amping on the curry powder (I really couldn’t taste the curry at all). The potatoes & radicchio were nice, but I didn’t eat many given my over-full-ness. The surprise of the dish for me? The lobster butter–it actually had chunks of lobster in it. Do you know how many restaurants advertise “lobster butter” on a dish’s description and then give some pasty version of a lobstery tasting butter that holds no traces of the actual crustacean. Kudos on the lobster butter! Overall, an excellent dining experience at Blue Apron. Although the restaurant was full to the brim when we arrived at 8 pm, but the time we left, we were the last patrons. That’s Salem/Roanoke for you. But no one seemed to rush us and, in general, the service was smooth overall. As far as decor goes, I really like it. I could go without the gilt chandelier, but the updated French bistro feel is warm and inviting, without making you feel like you’re in Aunt Hilda’s house. Plenty of gold/French/antique touches, but with a contemporary pared-down feel. You feel swank in a comfy way when you’re dining at Blue Apron, and I like that recession-ish vibe. 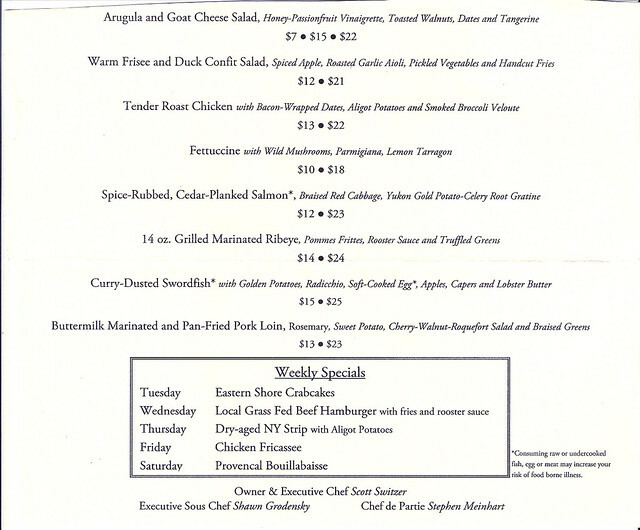 Below, I’ve posted the menu from February 23, 2011, and I don’t know how much it changes, but I have heard generally that it’s the same right now. I’m sure with spring and summer ingredients popping up soon, it will change, so go get that rigatoni while you can. You’d probably love some of the restaurants in uptown Charlotte. There are a lot of restaurants similar to the Blue Apron. Not that I ever could afford to go to them, though. I would totally eat that rigatoni and meatballs Right Now. I have to say John and I only split food about half the time (and if we do, it’s by eating off each others’ plates, not by asking for an actual split dish), but then he’s a vegetarian and I’m not, which is a pretty compelling reason. If you asked me, soft-cooked eggs are not as well utilised as they should be. Same goes for poached. Bravo Blue Apron! I’m new to your blog, and must say that I’m enjoying it completely. I, too, recently dined at Blue Apron and was completely bowled over by the service, the wine, the food, and the decor. The whole experience was so refreshing that I almost forgot that I was in little ol’ Salem. I had the rigatoni dish that you raved about, but this time the meatballs were veal and foie gras. Absolutely AMAZING! Nothing that was served to me and my friend was less than perfect. I’ll be going back to Blue Apron over and over, again. I had to opportunity to eat at this quaint little French restaurant a few weeks ago. I know French is expensive but did expect to get more for my order. Since every thing was ala carte I chose to just order the FULL order of tender chicken as my entree. I had to laugh at the small portion……it was rediculous and did not really come with a vegertable , etc. The small piece of spinnach under the tiny, tiny leg was supposedly the vegetable. It was tasty……..but I would hate to see what the half portion looked like. I ordered a glass of specific wine and he tried to bring a bottle of the house…….lack of communication. Not the best of restaurant experiences. Don’t be hungry when you go there ……it is gourmet and not particularly filling, to say the least. Over-rated and over-priced. Maybe in a tiny town like Salem this would be considered a great place. It’s not. At the end of mediocre food and sub-par service, we were actually asked to leave so they could sit their next guests. We were still eating dessert!! Save your money. Eat in Roanoke! !